The youngest national champion in American history, Greenleaf was a contender for the world title by the age of 16. In November 1919 - just a few weeks before he began a tournament that would make him the youngest national straight-pool champion in American history - the high-living Illinois native then known as the Boy Wonder of Pool would get implicated in a grisly, high-profile murder. 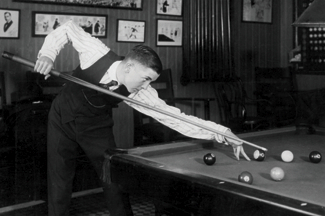 Many call Ralph Greenleaf America's greatest-ever pool player. Before it was all said and done, he would win the title 20 times - and often do so in grand style. In 1929, for instance, Greenleaf left Frank Taberski scoreless while simultaneously running 126 in a row. But shortly before sealing one of his most important victories ever, Connecticut police detained Greenleaf in connection with the dismemberment and murder of a New York City messenger. The man's headless body had been found dumped along the Milford Turnpike, not far from where police caught up with the young player as he was entertaining a poolroom crowd. Welcome back to Untold Stories. In this month's installment we'll continue to examine the life of Ralph Greenleaf, the nearly peerless world champion whose legacy of excellence was rivaled only by his reputation for wantonness. For my last column I interviewed a man who claimed to have crossed paths with Greenleaf shortly before his death. Consider this, then, as a sort of bookend to that earlier piece. Instead of examining the champion's twilight years, we'll consider here three years at the beginning of his career - just as Greenleaf first rocketed to fame. I've turned this month to the journalistic record - particularly the archives of The New York Times, the Chicago Tribune and the Los Angeles Times. I've also reviewed the "Official Rules and Record Book" from the BCA, and the "New Illustrated Encyclopedia of Billiards" by Mike Shamos. I've likewise reviewed a 1946 lawsuit filed by Greenleaf as well as some of my previous research for my book, "The Hustler & The Champ." Pool historian Charles Ursitti was also a valuable resource to verify many of the facts surrounding Greenleaf's rise to fame.